My office hours vary from day to day, and week to week, based on whether I go on a photo shoot, or need to take care of "out of office" business. You are most likely to reach me between 10am-3pm Monday through Friday. If I do not answer, please leave a message. Your call will be returned as soon as possible, usually within 3 days, hopefully sooner. 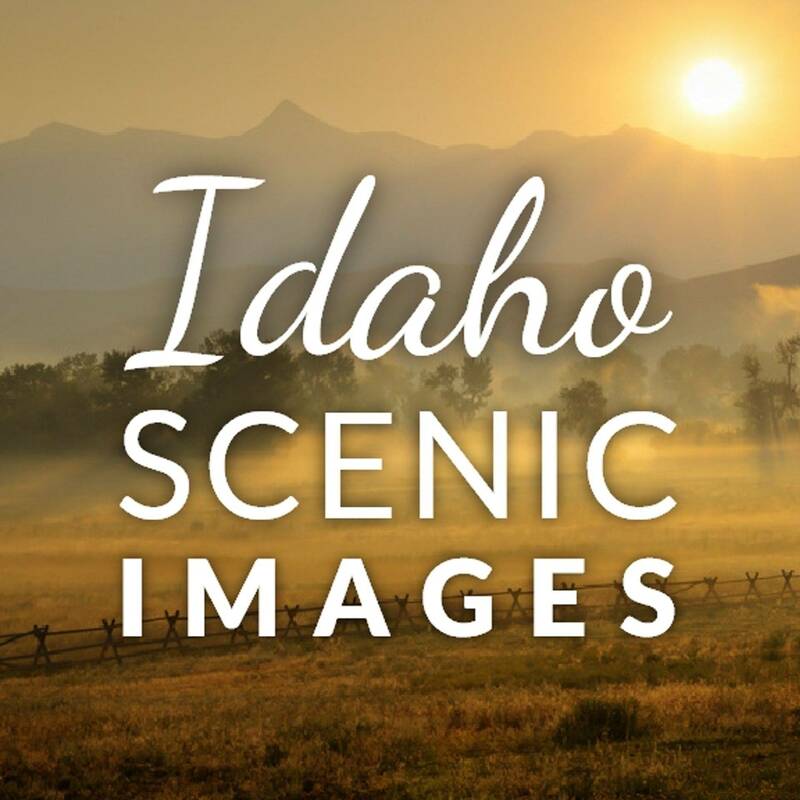 Follow my Idaho Scenics Blog, read about news and recent photo shoots. Fine-art professional photographer Linda Lantzy is inspired by the spectacular beauty and majestic landscapes of Idaho and the Pacific Northwest. A North Idaho native and Coeur d’Alene resident, Linda explores the roads less traveled, often in solitude, to capture the wild beauty and diversity of her home state. Her images reflect the region’s most breathtaking scenes, as they are captured with striking and dramatic composition. Linda’s passion for this beautiful place has defined her and drives her in the photographic arts. Her work can be found gracing the walls of hospitals, office buildings and private collections worldwide. 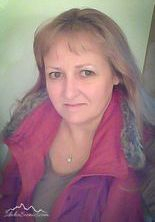 Linda began her photography career as a young teen and has been immersed in the medium ever since. She attended the Commercial Photography program at Spokane Falls Community College in 1987-1988, but gets her best training while working in the field. She’s spent countless hours studying light, detecting patterns, perfecting compositions and learning the technical intricacies of camera equipment and digital processing procedures. For Linda, photography is always an awe-inspiring investigation into the beauty of the world and how to best capture and share that beauty. Featured artist-Dec 2018~Angel Gallery, 5th and Sherman, Coeur d'Alene, ID. Teton Photography Group Show- March 1st-April 30th, 2018, Teton County Library's gallery, 125 Virginian Lane, Jackson, WY. "Gems of Idaho_Our Public Lands" Solo show Dec. 4th, 2017-Jan. 20th, 2018, Columbia Bank Community Plaza, Sandpoint, ID. 2 pieces accepted- August 4th-6th, 2017. Featured artist-June 2017~Angel Gallery, 5th and Sherman, Coeur d'Alene, ID. 2017 Idaho Conservation League "Artist in Residence"
Featured artist-Dec 2015~Angel Gallery, 5th and Sherman, Coeur d'Alene, ID. 2015 Idaho State Parks "Artist in Residence"
"Live the Lake" Juried group photography show at Redtail Gallery, Sandpoint, Idaho. Featured Artist- May 2013- Art Walk, May 10th, Angel Gallery. 5th and Sherman, Coeur d'Alene, ID. "Scenic Overlook" -Juried exhibit at Jacklin Arts and Cultural Center. -Open April 19th-May 10th, 2013. 405 Williams St. Post Falls, ID. Article and Photo Feature in "Teton Valley News" Nov. 1, 2012. 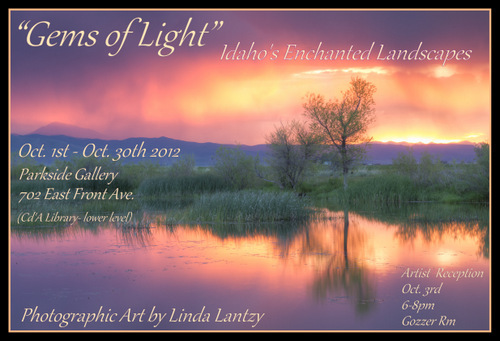 "Gems of Light- Idaho's Enchanted Landscapes" -Solo exhibit open Oct.1st-30th, 2012- Parkside Gallery,-702 E. Front Ave. Coeur d'Alene, ID. 2 pieces accepted- August 3rd-5th, 2012. JACC Photography Group Show -Juried exhibit at Jacklin Arts and Cultural Center. -Open April 20th-June 1st, 2012. 405 Williams St. Post Falls, ID. 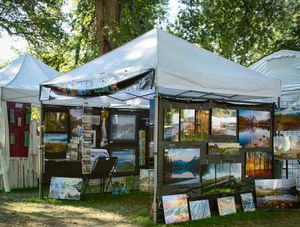 Art Fest, Coeur d'Alene Park, Brown's Addition, Spokane, WA. May 31st- Jun. 3rd, 2019. Art on the Green, North Idaho College, Coeur d'Alene, ID. Aug. 2nd-4th, 2019. Art in the Park, Julia Davis Park, Boise, ID. Sept 6th-8th, 2019.